Moray Way - No Way! The Speyside Way between Fochabers and Ballindalloch and between Nethybridge and Aviemore is suitable for cycling. Between Boat of Garten and Aviemore, the route is shared with a section of the SUSTRANS millennium cycle way. 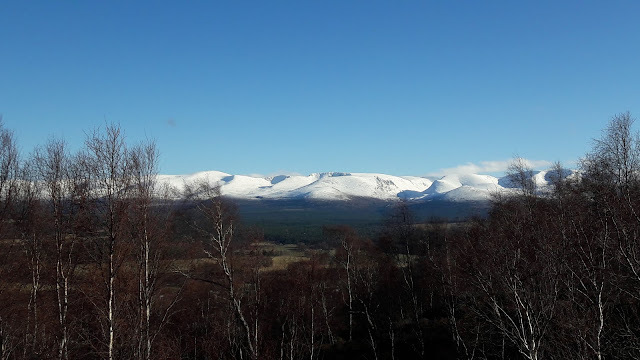 The 'off road' sections between Ballindalloch and Tomintoul, and between Ballindalloch and Cromdale cannot sustain cycle traffic, and we ask you to avoid them. Between Ballindalloch (Delnapot) and Cromdale an alternative exists using the B9102. Cyclists are asked at all times to ensure that they use the route in a way which does not cause damage to the track surface, or cause inconvenience or danger to users on foot or horseback. That seems pretty straightforward - "cannot sustain cycle traffic" is obviously a hangover from the days before the Land Reform Act and can safely be ignored. I mean, it's not like we're not roughty-toughty mountain bikers. That was the thinking as Neill and I discussed routes for a proposed bivvy. With his friend David back in the UK for a couple of weeks, we wanted something relatively straightforward and not a huge drive from Aberdeenshire/Montrose. I'd become aware of the Moray Way from a couple of recent rides in that area and it seemed to fit the bill fairly well. 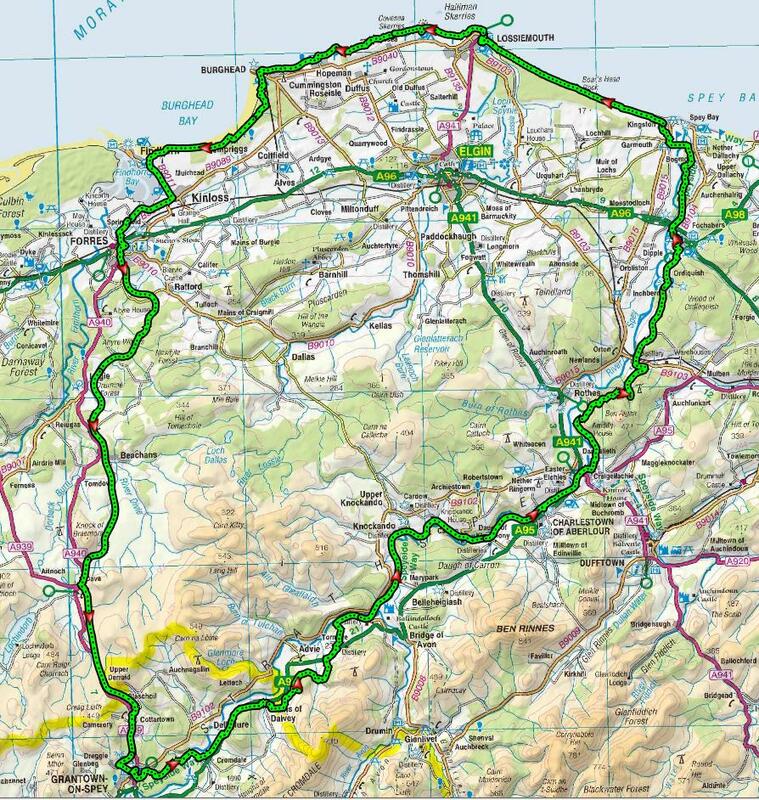 It's an amalgamation of the Speyside Way, the Moray Coast Trail and the Dava Way, coming in at around 100 miles/160 km. In fact, I'd cycled most of it before, though I'd always taken to the minor road along Speyside rather than stick to the signposted route. This seemed like the perfect opportunity to correct that and to scout out the remaining sections. Meeting up in Grantown again had a familiar ring to it as we'd set off from here on a similar, shorter, trip in December. This time though we were straight on to the trail rather than having lunch first. The initial section of the SSW from here takes a few, easily missed, turns through Anagach Woodlands on its way to Cromdale. Here we passed a lane to the B9102, the possible road-based detour that would take us to Ballindalloch. Not for us though, we decided we'd stick to the marked SSW all the way to the coast. And it was at Cromdale we started to encounter the notorious Y walking gates. Now, they're a clever design, if they're only to be used by walkers, but with a fully-laded bike they are a complete nuisance. We soon developed 2 techniques; Option A involved trying to jam the gate open and then bumping the bike through on its rear wheel. This worked frequently. Where it failed we resorted to Option B. This needed two folk to hold the swinging sections of the gate open while the third rolled their bike through. By the time we'd done a dozen, we were getting pretty adept at it. Crossing the A95 we were soon into the section I'd never ridden, through the forest on Tom an Uird. This turned out to be very straightforward forest track and we were wondering why there'd been any need to persuade cyclists to avoid it. A short fast descent took us to a minor road crossing. As were were doing our gate routine here, a friendly farmer suggested we should avoid the next section as "we'd end up walking it all". Of course, we thanked him for his advice but looking ahead, the track seemed completely fine. It was 11:12 and we were looking forward to lunch in Aberlour. When we next crossed the A95, it was 13:15, during which we'd travelled the grand sum of 8 km. Not shown on the OS maps is that the official SSW has now been diverted up another hill and round some boggy, bouldery field margins. We were reduced to walking almost all of it, watching our timetable slip and all the while dealing with more of those damn gates. Sticking to the A95 for 5.5 km would have saved us almost two hours of clarty bike-manhandling. As it was, the pain was mostly over by the time we reached the old railway line down by the river (one particularly cow-trodden field notwithstanding) and we spun along to Aberlour as fast as we could reasonably manage. Sorry sir, you missed the last train. Lunch was, by this time, very much appreciated and when we left we were spinning along quite merrily for a while but the mornings toils had taken their toll on Neill and he was finding it hard to keep up on the Ben Aigan and subsequent climbs. As a result, it was dark by the time we reached Fochabers and any thoughts of a short break here were dispersed by our need to make progress towards our planned overnight stop. That'll be the lights on then? We'd already scaled back the days riding a little, reckoning that any spot just past Lossiemouth would have to do. Personally, I was just worried about getting some food and in particular that we'd miss the chance if we delayed any further. Neill was now beginning to cramp up a little and by the time we reached the SSW turn off onto NCN1 and the Moray Coast Trail he had already resorted to walking occasionally. We considered taking to the road to Lossiemouth rather than the beach trails but reckoned it would be slightly longer and, as we were already beginning to see the lights of Lossiemouth, made a bee-line along the beach as best we could. Poor David was struggling occasionally on his "unfashionable" 2.1" tyres and the patches of soft sand but we mostly managed to stick to the firmer stuff. With Lossiemouth still a little away, I persuaded Neill it might be a good idea to get some food in him. Not that he didn't have any, just he was saving it for "when he really needed it". Yeah, I reckoned that time had come. Desperate not to lead us on any unwanted diversions I took to scouting ahead a little at a time, making sure the track was passable etc. Being on the beach, in the dark, with the waves crashing on the shore was a pleasant diversion from the mild stress I'd developed considering the food options and worrying about Neill. It was almost 22:15 when we reached Lossiemouth and we knew that any sit-in opportunities were well past. Fortunately we found takeaway Chinese and takeaway Pizza shops within a few feet of each other. A brief discussion of options and we were in, ordering pizzas. I'd not normally comment on such things but I really, really have to give a big shout out to the guys at Pino Pizzas in Lossiemouth. 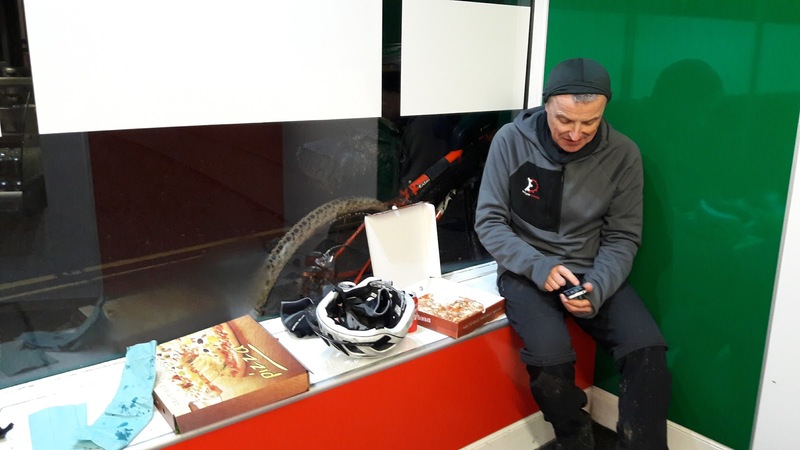 Not only did they give us great pizzas, but they let us sit on their inside window ledge, distribute our muddy gear around and basically take over the place. Quite what they made of us, I don't know but we were offered use of the staff toilets too. Did sir reserve a table? All of that would have been OK but when Neill got his pizza, he sat with it on his lap, opened the box to let it cool and there was then a comedy moment as the whole lot slid off and onto the floor, of course turning upside down in the process. The look of desperation on his face was at the same time both amusing and frightening. Having struggled all afternoon and evening, here was his meal laid out on the floor of a takeaway. I did, at first, think he was going to eat it regardless but he came to his senses and went to order another. By now, the guy at the counter had realised what had happened and offered to make another. There was then a bit of a stand-off as Neill insisted he pay for it and the server insisted he wouldn't take any money. I, meanwhile, was already wolfing into mine - carefully! It was 23:10 when we then set out to find a camp spot. All the previous delays had now conspired with the tides to put the broad, sweeping, easy to ride beach out of bounds to us and we had to take to the trail in the dunes. With a combination of gorse and tall maram grass, trail finding was exceedingly difficult and every time we looked down to the beach, it was either beyond a steep drop or still covered by the sea. The dunes themselves were no use for pitching on but I was aware that we'd eventually leave the coast a little and head uphill where the terrain would change, so this became the point I was focussed on. By the time we reached a likely spot it was 00:30. We scouted around for a while and, while nothing was perfect, we decided this would have to do. At 1 am we were finally stopped for the night, tents pitched. I lay down in the sleeping bag, watching the occasional break in the clouds and then awoke with rain on my face. I must have fallen asleep in a few seconds and had done so without fastening up the tent. I did so now, listened to the rain for a couple of minutes and then passed out again until the morning. Regardless of the fact that we had longer to cycle today than we had planned, I didn't get the impression that anyone was in much of a hurry in the morning. Having been along this way just a few months back, I knew that we'd be cycling almost all day today, only one short section of cliff-top stuff around Hopeman to get in the way. Pulling into Burghead, I made straight for the Bothy Bistro. It didn't disappoint. Pancakes with bacon and a couple of coffees soon made everything alright and we set off for home. The day was also getting warmer and by the time we reached Roseisle Forest we were all removing layers. I even ended up in shorts. Findhorn gave us another chance to top up on calories and caffeine before the drag up Dava Moor so it was into Macleans for Lasagne pie and toasted teabread. The Dava Way is, by now, so familiar to me that I can almost recount every twist, turn and hill. Neill was still struggling along so it was a case of cycle along, stop for a while, repeat, repeat. However, by the time we reached the Half Way hut, we both knew it was almost all downhill back to Grantown so we took an extended break while David caught up on the wonders of electric lighting before covering the last few miles back to the cars. And just look at those big, wide, cheesy grins! At "only" 160km, this should have been a relatively easy trip. In fact, I'd been harbouring a desire to knock it off in one, long, summer day. However, even allowing for careful timing to allow for the tides, I reckon the signed Speyside Way section that we walked is going to eat into times too much. Using the B9102, as the Speyside Way folk suggest, would probably cut a good couple of hours off our timings anyway but then there's the feeling that you'd not really done the "proper" route. Now I've done it all, I'll certainly be advising anyone who asks to avoid that section. No point in everyone being as stubborn or obstinate as me! For what it's worth, our total moving time ended up at just under 16 hours. Despite my history of foot problems, I've dabbled with running on and off since Mim took it up in training for her Everest trip. 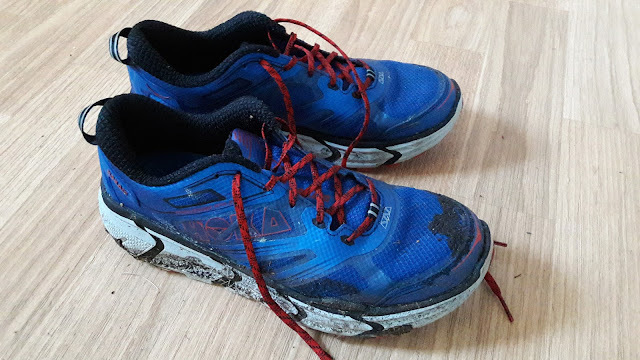 I learnt to ignore the immediate discomfort of sore calves and work through it until the running felt easier. I slowly got a little faster and able to run a little further.... then gave it up almost completely. As Mim has now started a series of 10k and half-marathon events, I've re-started in order to give her some company and encouragement. I've even bought various running shoes in order to see what works best for me. As a result of the A9 dualling programme I got sight of a map showing a path linking two other areas I knew and today went off to explore it, thinking that a bike would likely be a hinderance. The path exists only as a figment of someones imagination,even though a short section has some rudimentary waymakers in the shape of little sticks with a daub of yellow paint on . Even round these sticks, no trace of a path exists. Following made tracks, deer tracks and often no tracks, I got back with soggy, muddy feet and scratched legs after scrambling through heather and birch forest in search of this elusive track, but.... I also got a wonderful feeling of freedom. No chasing fastest times, no planned route, just wandering through ancient woodland with deer around, with the birds singing and taking the opportunity to pause as I went, get the sun on my face and the fresh air. I even discovered a local bouldering crag that I never knew existed. It would appear that, even at age 58, an old dog really can learn new tricks.